Here's a superb new online slots game from Eyecon which you can play. This 5 reel, 25 payline slot from Eyecon is sure to get the party started, with a jackpot worth up to 9500x your stake! The cherry on top of this birthday cake is low volatility and a RTP rate of 95.4% - odds that are sure to put a smile on your face. Some straightforward but fun bonuses are on offer, keeping players engaged in this easy-going slot. Yes, it is a bit cheesy and might not be for everyone, but why not take a trip down memory lane and remember the wholesome fun you used to have at old-school kids birthday parties! Be prepared for some serious cake cravings – symbols include icing loaded cupcakes, large chocolate birthday cakes, and sparkling glasses of champagne that are sure to put you in a party mood! Check out our entire game of casino now. Eyecon Pty Ltd is an Australian based company producing popular slots. They have over one hundred slots in their portfolio and have been producing high quality games since 1997. Their expertise and focus is in land-based gaming rather than online casinos, so do not expect to find cutting edge technologies or stellar graphics in their slots. However, if you’re happy with games that are slightly more traditional and slightly less complex, you’ll enjoy their portfolio. 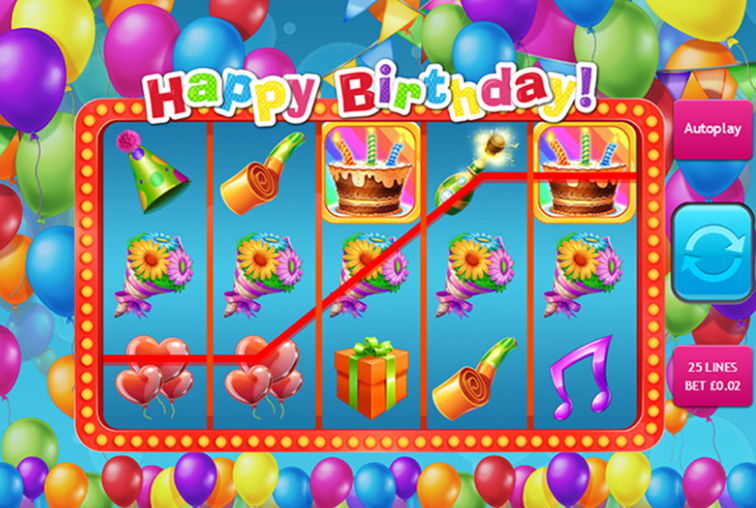 If you enjoy Happy Birthday you should try their similar slots such as Sugar Train and 99 Time! The five reels are set against a brightly coloured backdrop of balloons. The symbols are all classic birthday party related paraphernalia such as cakes, champagne, flowers, presents, and cute fluffy toys from Eyecon’s Fluffy Favourite slot game! My favourite was the adorable panda! The biggest jackpot on offer is 9500x your bet, and is achieved when you line up three streamer symbols. The next most lucrative win is achieved by lining up five pandas or hippos – either of these will secure you 950x your stake. It is worth noting that the highest amount you can bet is 0.50 credits, and the minimum is 0.01 – this means that even the highest jackpot can only get you 4750 coins. Accordingly, those looking for big wins will probably not find this game to their taste. The streamer also acts as a wild, completing any other winning line, and the birthday cake scatter will multiply your bet by 450 if five or more appear on screen at any one time. The scatter also gives you 15 free spins.